The Trifecta Training Video will be a useful guide for anyone with a puppy or even a young adult canine companion. Our video should be the most used reference tool in the library of new puppy owners. It’s the complete program, a recipe for success! 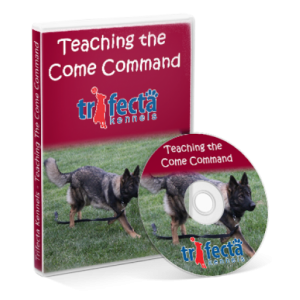 The methods demonstrated in this easy and fun video have launched the careers of thousands of Therapy dogs, hundreds of titled obedience dogs, and vast numbers of well trained family canine members. Help make your new family member be one of our “Trifecta success stories.” Order your copy today. The $35.99 purchase fee is a small investment in the future costs involved with dog ownership. And we know the message of PROBLEM PREVENTION, so well covered in our video, is priceless. Get started on the journey of puppy training by choosing our video, good luck! Lisa, Grace and the Trifecta Team.